1. What is Destiny City Comics? 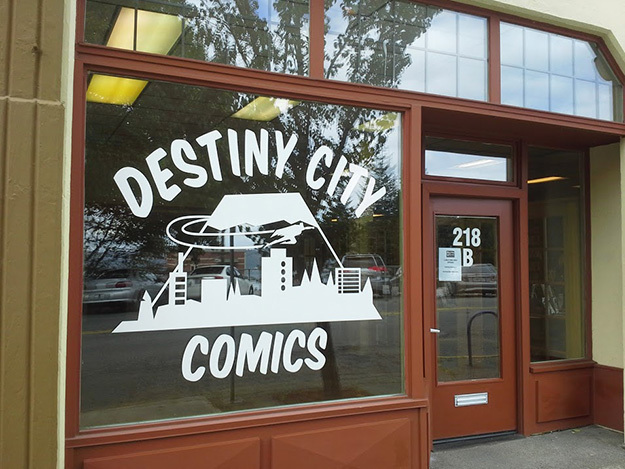 Destiny City Comics is my new comic shop set to open October 1. I want the shop to be a destination for comic book lovers. I hope to make available a healthy variety of works by esteemed creators. 2. Why did you want to open a comic book shop? It all just kind of came together. After seeing RR Anderson post about an upcoming informational session and deadline, I thought I’d pitch the idea to Spaceworks Tacoma and they were incredibly supportive. I wouldn’t have had the confidence to open a shop without their enterprise training. When I saw the spot next to King’s Books was open I really thought that would be a great fit for my comic shop idea that I’ve been working on for the past few months. 3. What do you think is the most misunderstood thing about comic books? I think one of the bigger things might be the misconception that comics are just about bone-headed superheroes smashing their way through problems, but while there are plenty of those and they can be fun there’s a lot more out there. I hope to be able to connect people to comics they can really enjoy because there’s a lot of high quality stuff out there by passionate creators. 4. What is your favorite comic book story and why? You know I’ve read a lot that I really enjoy but I think I have to go with Death: the High Cost of Living for this one. I wrote about this book for local arts and culture magazine Post Defiance when we read it for the Comics and Pizza Club at King’s Books (http://postdefiance.com/ten-things-i-learned-about-life-from-death-the-high-cost-of-living/). 5. What do you hope for the future of Destiny City Comics? I want to ignite imaginations with some great literature and make the shop a fun place to visit. I want to encourage single issue or trade paperback subscribers for repeat business. I also hope that it will be a cultural hub for Tacoma and host unique art events.